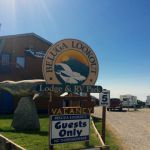 Many visitors to Alaska (and many locals too) prefer the comforts of a home on wheels, and find themselves enjoying the benefits of an RV park with RV hookups and other amenities that make their stay much more comfortable. Many RV parks are located near excellent fishing or hunting opportunities, or great places for relaxing and wildlife viewing. Offers full RV hook-ups, pull-through sites, wifi, cable TV, restrooms, showers, laundry and fish cleaning facilities. Located on the bluff overlooking the mouth of the Kenai River. Full hookups (20 sites), 30 / 50 amp electric, rest rooms, showers, laundry, RV dump station, store. 26 sites (four are pull-through). There is also a boat launch to the Kenai River. Available amenities: Electric hookup, tent sites. 52 slide-out accommodating RV sites, 9 pull-through sites accommodating RVs up to 60 feet, full hookups with 30 amp electric, RV dump station, fire rings, laundry, restrooms, showers, fish processing. Full hookups, electric-only hookups, RV dump station, laundry, fish cleaning station, freezer space for your catch, convenience store, tackle shop. Contains 55 RV sites on 60 wooded acres between the Kenai and Kasilof rivers. 30 amp hookups, RV dump station, pull-through and pull-in sites, fish cleaning station, fire rings, and a hotel with private baths, a restaurant and bar. RV park with electric hookups and dry sites. Located between Deep Creek and Ninilchik.